Hyam Plutzik, poet and English Professor at the University of Rochester, was born July 13, 1911 in Brooklyn, New York. He was the son of Russian Jewish emigrants, who arrived in the United States in 1905. 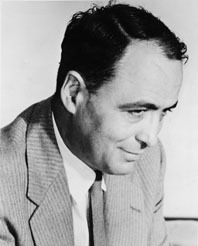 A year after his birth, his family moved to Southbury, Connecticut, where his father headed a Jewish community school. In Plutzik's home, Yiddish, Russian, and Hebrew were spoken. Plutzik himself did not learn English until he began grammar school. This school Plutzik described as one room, in the countryside, with a student body of fifteen. His first interest in poetry arose in this rural environment, where, as he later recalled, being thrown^Mback upon his own resources gave spur to his imaginative faculties. At age twelve, Plutzik moved with his family to Bristol, a manufacturing city near Hartford. There he had greater access to libraries and became an avid reader. Upon completion of high school in 1928, he won a Holland Scholarship from Trinity College. He majored in English and studied closely with Professor Odell Shepard, who later in 1938 received a Pulitzer for his biography, The Life of Bronson Alcott. In his senior year at Trinity, Plutzik was associate editor of the college's literary magazine, The Trinity Tablet, which printed his short story, "The Golus," and a group of poems, titled "Three Paintings." Plutzik graduated from Trinity College, Phi Beta Kappa, in 1932. He continued his study of literature and poetry with a two-year fellowship from Trinity College to Yale University Graduate School. The first significant recognition of his talent in writing poetry came in 1933 when he won the Yale Poetry Award for "The Three." The poet, Stephen Vincent Benet, a previous recipient of the award, sat on the judging committee. Benet and Plutzik continued to correspond with each other through the 1940s. Ambitious intellectually, but uncomfortable with the pro forma discipline of academic life, and perhaps uncertain about it as a context for his writing ambitions, Plutzik left Yale at the end of his two-year fellowship, his degree unfinished. For the next six years, he worked at various jobs, taking one year off to explore his writing abilities. He first moved to Brooklyn, where his parents then lived, and worked as a feature writer and secretary to the editor of the Brooklyn Daily Eagle. During this period, 1934-1935, he wrote the poem, "Seventh Avenue Express." The following year he was an editorial writer for the Newark Ledger in New Jersey. In 1936-1937, he lived in the Connecticut countryside, trying his hand at a satirical novel on a timely subject for the 1930s--dictatorship. "My Sister" was written the following year when Plutzik was twenty-six years old. The poem expressed his loss at the death of a sister fifteen years earlier. At some other point during this period, 1937-1938, Plutzik composed "Death at the Purple Rim." Both "My Sister" and "Death at the Purple Rim" were eventually published in his first collection of poems, Aspects of Proteus (1949). The name, Purple Rim, had been given to a Connecticut valley by the people with whom Plutzik stayed during his year in the countryside, and the long narrative poem, addressing a confrontation between human and animal, was prompted by his experiences doing outdoor labor there. In 1942, Plutzik enlisted in the Army, becoming first a drill sergeant, then first and second lieutenant. He was ordinance and army education officer for the Army Air Corps, Norfolk, England. During the war, he married Tanya Roth, who had previously been a social worker, and during the war was a researcher for the Office of War Information. Numerous moves--twelve different cities and twenty different houses before going overseas--and the lack of private time in army life made it difficult for Plutzik to continue to write poetry. The only poem he was able to complete was "Elegy." But he did create an outline for and composed the first twenty lines of the long narrative poem, "Horatio," published in 1961. A narrative of the life of Hamlet's friend, Horatio, the poem told the outcome of Hamlet's charge to him that he explain Hamlet's life to succeeding generations. Plutzik took up the poem in the early 1950s, finishing the whole, a 2000 line work, in 1955. He consulted with Robert Penn Warren about the concluding section of the poem. It was published in 1961 by Atheneum. 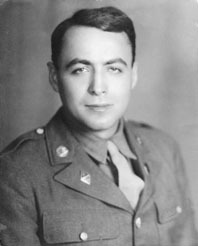 Upon discharge from the Army, Plutzik became an instructor in the English Department at the University of Rochester. That same year, 1945-1946, he submitted "House of Gorya and Other Poems" to Scribner's. Scribner's turned down the manuscript. Plutzik composed an additional fifty-two poems within the next several years. These were included in his first published collection, Aspects of Proteus (Harpers, 1949). His second collection, Apples from Shinar (Wesleyan University Press, 1959) contained thirty-two lyric poems, and "The Shepherd," a section of "Horatio." Throughout his career, Plutzik published poems in journals and magazines such as Poetry, Yale Review, Antioch Review, Kenyon Review, Sewanee Review, Prairie Schooner, Accent, and The Nation. In 1950, he received for Aspects of Proteus one of six awards given by the American Academy and Institute of Arts and Letters. In 1951, he shared the California Borestone Mountain Poetry Award with Rolfe Humphries, and, in 1959, received the University of Rochester's Lillian P. Fairchild Award for Apples from Shinar. Important themes throughout Plutzik's poetry are the relationship between poetry and science as modes of expression, the paradoxes of historical time and eternity, and questions of Jewish identity. He also translated and wrote prayers. In 1954, Plutzik received a Ford Foundation Faculty Fellowship to explore the relationship between poetry, science, and philosophy. "Intellectual Autobiography and Proposed Project" (Box 4, folder 3), which he wrote for the application, explains the kinds of questions he wished to explore. In addition to poems such as "An Equation," and "Entropy" in Aspects of Proteus, he wrote about science and poetry in prose essays such as "The Einsteinian Awareness in Auden" (Box 20, folders 3-6), "The Problems of the Poet and Poetry in Our Times" (Box 34, folder 12), and "The Protean Universe" (Box 34, folder 13). All of these were written in the 1950s. Plutzik's last published work was Horatio (1961). A "Plan for Work" (Box 4, folder 8), written in October, 1960, outlined what Plutzik hoped to bring to fruition in the coming years. These were a long poem on the Holocaust, and a play in verse on the fall of Athens in the Peloponnesian war. In the poem on the Holocaust, he planned to include a section on Ann Frank, and another on Lapichi, the Russian town in the Czarist province of Minsk, where his family had originated. Unable to begin either of these projects because of illness, Plutzik died at the age of fifty, of cancer, on January 8, 1962. Since his death, his poems have been included in many anthologies, such as Five American Poets, The Voice That Is Great Within Us (1970), Beginnings in Poetry (1973), Voices within the Ark; the Modern Jewish Poets (1980), and others (see acompanying bibliography). In 1987, Hyam Plutzik: The Collected Poems was published by BOA Editions. At the University of Rochester, the Plutzik Memorial Poetry Series continues the practice of poetry readings he had begun. 1911 Hyam Plutzik born, Brooklyn, New York, on July 13. 1937 Writes Death at Purple Rim in September. 1941 Receives Yale Poetry Award for Death at Purple Rim. Death at Purple Rim is privately published. 1942 Enlists in the Army. Becomes drill Sergeant. 1943 Marries Tanya Roth on February 21. 1943 - 1945 Writes Elegy. Conceives idea for Horatio, jotting down the opening twenty lines. 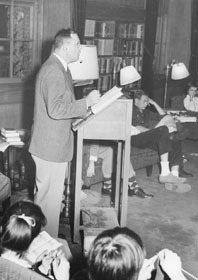 1945 Becomes Instructor in the English Department at the University of Rochester in November. 1945 - 1946 Submits House of Gorya and Other Poems, containing My Sister, Mythos, and Seventh Avenue Express, to Scribners unsuccessfully. 1961 Horatio, a long narrative poem, is published by Atheneum. Appointed to new English Department position, Dean Professor of Rhetoric and Poetry. 1962 Dies in Strong Memorial Hospital, Rochester, NY, of cancer in January. 1987 Publication of The Collected Poems of Hyam Plutzik (BOA Editions), with forward by Anthony Hecht. 2007 Release of documentary film Hyam Plutzk: American Poet, directed by Christine Choy and Ku-Ling Siegel. 2011 Celebration of the centennial of Hyam Plutzik's birth. 2011 New publication of Apples from Shinar (Wesleyan University Press), with forward by David Scott Kastan.